Constructed using a combination of advanced modern textile fabrics and traditional leather, the WEISE® Oslo Shorty summer glove is a cool choice for summer riding. Nyspan (a four-way stretch fabric woven with elasticated yarn) and mesh are used at the back of the hand for both flexibility and – combined with perforated leather at the knuckle and finger sections – breathability. Unlike many summer gloves, the Oslo has a soft comfort lining, fitted using the patented mcFit® system that bonds the inner and outer without any stitching. So, alongside eliminating uncomfortable joins and seams, it will not twist, crease or pull free. Soft and flexible napa leather is used on the palm and fingers. Napa is exceptionally flexible for feel and comfort, but is tough and abrasion-resistant too. 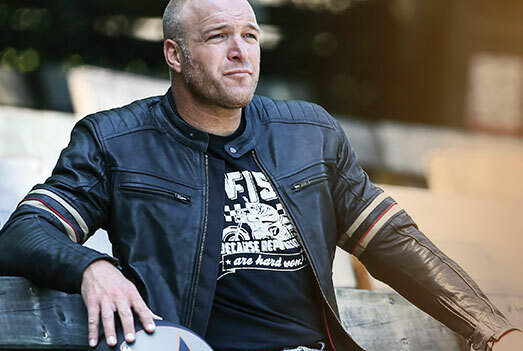 Combined with padding and double-layered leather in key areas and carbon reinforcement to the knuckle, riders can be confident in its construction. Adjustable Velcro® cuff closure allows the Oslo Shorty to be worn either under or over a riding jacket, depending on the wearer’s preference. The WEISE® Oslo Shorty is available in sizes S-3XL in black. RiDE magazine has recommended the Weise Daytona gloves in its comprehensive summer gloves test. The Daytona came top of the short gloves on test and was awarded the coveted RiDE triangle. “These well made gloves broke in quickly and have very comfortable armour” noted the tester. All of the gloves were tested by independent laboratory SATRA to the CE standards for impact and abrasion resistance, both of which the Daytona passed. 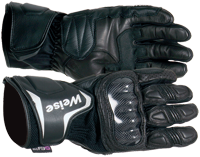 Weise Daytona gloves come in sizes S – 3XL (XS – 4XL in Black). Colour options are Black, Black/Red, Black/Blue, Black/Orange, Black/White, Black/Yellow. Click here for details.